LETR FUNDRAISING HANDBOOK - NEW! 2019 Runner Registration/Pledge Form - NEW! Law enforcement officers from over 100 Louisiana agencies (police departments, sheriff’s offices, Louisiana Department of Corrections, Louisiana Department of Wildlife and Fisheries, Federal Bureau of Investigation, Drug Enforcement Agency, U.S. Customs, and all branches of the United States Military) all participate in the state-wide torch run to benefit the athletes of Special Olympics Louisiana. Each year, over 3,000 officers carry the torch on a relay throughout Louisiana. 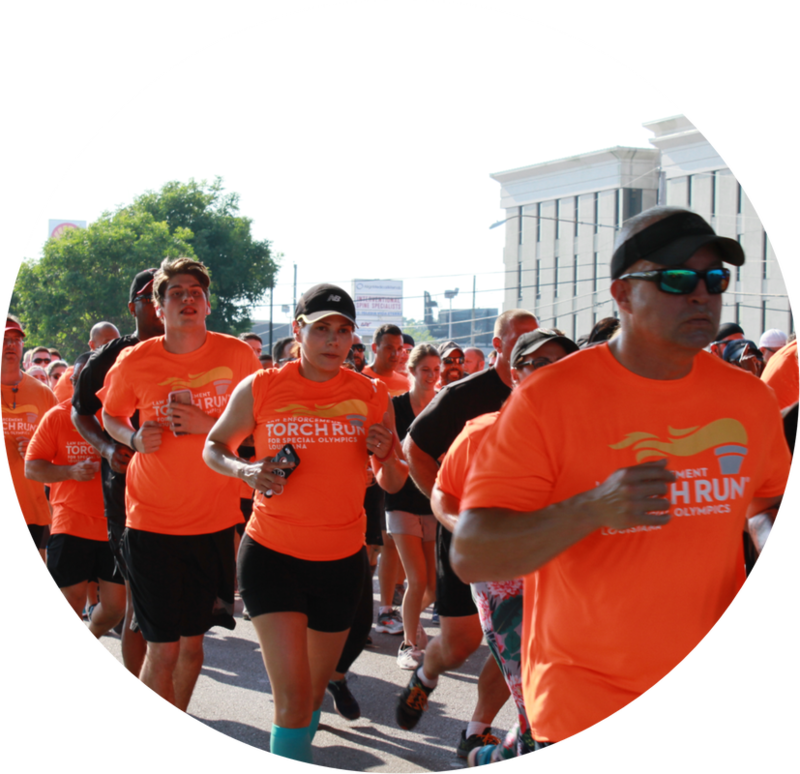 Funds are generated through contributions from individuals and businesses along the way and through sales of the popular Torch Run T-shirts. The intrastate torch relay will culminate at the Opening Ceremony of our Special Olympics Louisiana State Summer Games in May. Officers from around the state join together to bring the Flame of Hope™ into the stadium. ​For exact times and routes, please contact your local Police Department or Sheriff’s Department. Dates/cities subject to change. Pre-Run Activity: Meet at the Lafayette Parish Sheriff's Office for pictures and the ceremonial lighting of the Flame of Hope. The run will begin at 8am at Main and Lafayette. Stop at the Apallo Intersection. Board vehicles for the Carencro city limits North on LA 93 to Gloria Switch at the round-about. Go East on Gloria Switch to University. Turn left, heading north on University to starting point in Carencro. Run through Carencro for about 2 mile. Board vehicles to Opelousas *Set up vehicles at City Park @ Crestwell and 182. Down 182, onto 190 towards info center.Drink, food, music and fun after the run! Contact: Aggie Trahan at 337-236-3906 or aggie.trahan@lafayettesheriff.com for more info. Registration opens at 7:30am with the run at 8am. Start location is Troop C (4047 West Park Ave.) and will continue to the Tourist Center ( 4484 Hwy 1, Raceland 70394) under the Raceland over pass. Hwy 1. Following the run there will be a BBQ at the park around 10:30/11am with lots of food, drinks, music and fun. Contact: Nancy Comardelle at 985-449-4487 or nancy-comardelle@lpso.net. Runners will meet at Ascension Parish Sheriff's Office (828 Irma Blvd) to be shuttled to Gonzales Municipal Park on Burnside Ave. for a 9am start. The run will end at The ARC of East Ascension. Contact: Bob Escamilla at 225-588-4084 or bescamilla@ascensionsheriff.com. Official Torch Lighting Ceremony begins at 8:30am at the North Boulevard Town Square in downtown Baton Rouge. The Baton Rouge Torch Run will begin immediately after the ceremony. Check-in at 9:30am for 10am run. Starts/ends at Mandeville Trailhead (675 Lafitte Street, Mandeville) and runs through Old Mandeville. Contact Casey Cantrelle ccantrelle@laso.org for more info. Run starts at 9:30am at G.M. Varnado and Sons Automotive Center (2500 Florida Blvd SW, Denham Springs) and continues to the Livingston/Tangipahoa Parish line. Tangipahoa officers will receive the torch from the Livingston officers at the Tangipahoa Parish Line on Hwy 190 W. in front of Hammond State School and continue to Southeastern Louisiana University for State Summer Games Opening Ceremony. Registration at 7am for 8am run at Kenner Police Headquarters (500 Veterans Blvd.). Enter in the back gate of the building on Nick Congemi Drive, for check in, T-shirt pick up, and to load buses. Party hosted by KPD with lots of Drinks, Food, Music and Prizes. Contact: Ninoska Guggenheim at 504-712-2395 or nguggenheim@kennerpd.com OR Ken Guichard at 504-363-5500 or guichard_kj@jpso.com. East Carroll/West Carroll/Madison Parish - RUN INFO COMING SOON! Union Parish - RUN INFO COMING SOON! Agencies on the East side of the Red River will meet at Bossier City Civic Center, Bossier City and will end at Relay Station, 10281 Hwy-1 South, Shreveport LA. Contact: Chad Davis at 318-773-2582 or chad.davis@caddosheriff.org. ​DeSoto Parish - RUN INFO COMING SOON! The run will begin at 8am at Grant Parish Courthouse (200 Main Street, Colfax) after a welcoming ceremony. They will end the run the courthouse. The distance is 1 mile. Contact: Wendy Charrier at 318-447-0565 or wcharrier@rpso.la.gov. The run begins at 10am at the Pollock Ball Park on LA 8 and ends at Grant 1 Stop LA 165/LA8. Run begins at 11am at Magnolia Hill, Magnolia Street, Jonesville, and ends at Utility Baptist Church on LA 84. The run will begin at 9am at the LaSalle Courthouse (1050 Courthouse Street, Jena) with ceremony. They will end the run the courthouse. The distance is 1 mile. Contact: Wendy Charrier at 318-447-0565 or wcharrier@rpso.la.gov. Runners will start at 9am from Pinecrest Supports and Services, 100 Pincrest Drive, Pineville. 10:30am @ Pinecrest City Court, Main Street, Pineville to Rapides Courthouse, Alexandria. 2pm Alexandria Police Dept, 1000 Bolton Ave, Alexandria, to Louisiana State Police Troop E, 1710 Odom Street, Alexandria. Contact: Wendy Charrier at 318-447-0565 or wcharrier@rpso.la.gov. Check-in at 7:30am; run starts at 8am from Calcasieu Parish Regional Law Enforcement Training Academy (3958 Mallard Cove, Lake Charles, LA) and ends at Calcasieu Parish Sheriff's Office, where the run will end (5400 E. Broad Street Lake Charles, LA) Contact: Kayla Vincent at 337-302-1848 or kvincent@cpso.com. The Louisiana Law Enforcement Torch Run has successfully expanded because committed individuals and programs have generously shared ideas, resources and information. 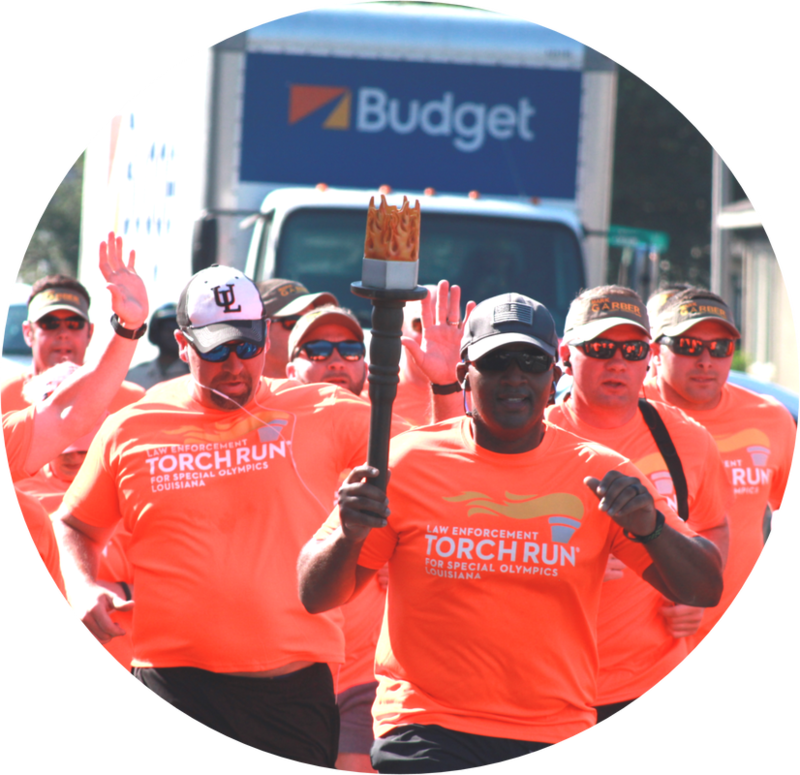 Below are links to many of the resources you'll need as an active member of the Torch Run. 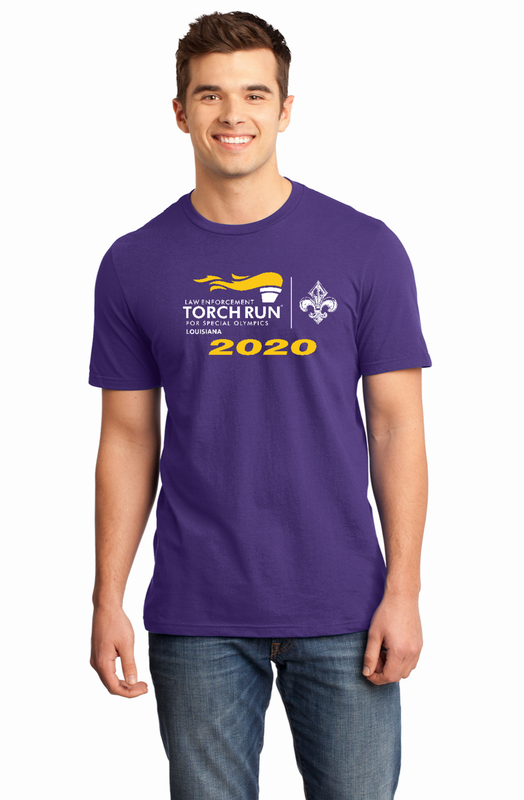 Please contact Special Olympics Louisiana if you have any questions or need additional information about Torch Run activities in your area. If you are unsure who to contact, view our LETR Leaders page. How to Register - This document explains the rules, registration deadlines and ordering processes for the Law Enforcement Torch Run. Cash Form - Use this when having multiple donations/transactions monetary or inkind donations. This will help ensure that your donation and the donor are receiving proper recognition for the given donation. If you are a member of a law enforcement agency and would like to become involved in the Louisiana Law Enforcement Torch Run movement, contact us.